High quality straight razor gift set from Colonel Conk, with a 6/8" Dovo straight razor from Solingen, Germany. The straight razor has a black acrylic handle. The 6/8" blade is ideal for heavy beards. 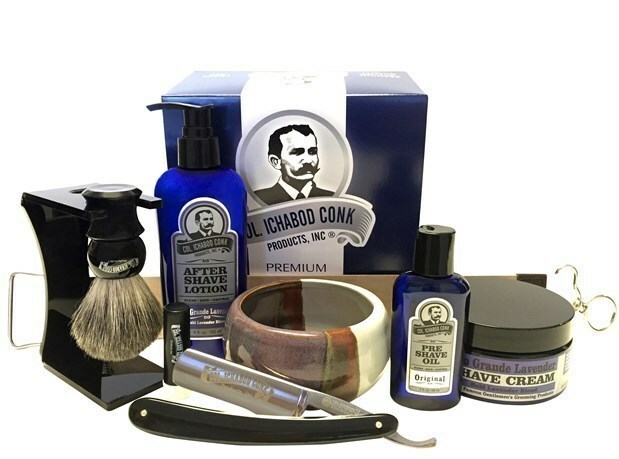 Badger shave brush with a black handle, along with Colonel Conk's "Santa Fe" shave mug, handcrafted in the USA. The Rio Grande Lavender scent is created by an exclusive blend of essential oils. This is a Bold Lavender Blend with a little less flower and a little more masculine edge to it! Leather & Linen strop, shave stand for the brush and straight razor, and a styptic pencil also included.